Dennis and Judy Groth are natives of the South Bay Area of California (Sunnyvale and San Jose) and lived there until 1985, when they moved to Napa Valley. Dennis worked at Hewlett Packard while attending college at San Jose State, and in 1966 began his career as an accountant at Arthur Young & Co. (Now Ernst & Young). He became a CPA in 1968 and a partner of the firm in 1977. In early 1978, he left Ernst & Young to become Chief Financial Officer of Atari, a games and electronics subsidiary of Time Warner. During the years 1978 to 1984, Dennis also served as Executive Vice President, President of the consumer products division, and finally, President of the international division at Atari. In 1981, the Groths purchased a 121-acre parcel in Oakville. In 1982, they added a second vineyard of 44 acres located south of Yountville. These vineyards, which total 165 acres on the valley floor of Napa, are the primary source of grapes for the Cabernet Sauvignon, Chardonnay and Sauvignon Blanc wines produced by Groth Vineyards & Winery. Groth Vineyards & Winery was established in 1982, and they crushed the first grapes for their own wines that same year. Production increased quickly to 30,000 cases by 1984. 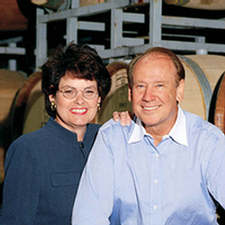 By 1985, the winery needed full-time attention from Dennis and Judy, so they moved their family to the Oakville property. In 1990 the original winery building was completed; a major expansion of facilities was completed in 2007. Since 1982, Groth Vineyards & Winery has established a solid reputation as an outstanding producer of Napa Valley wines. As with most family wineries, Dennis, Judy and their children all get involved in a little of everything. Dennis puts his focus as president on running the business and playing an ongoing leadership role in the broader California wine industry. Judy is responsible for the look and feel of the winery, from its distinctive California Mission facilities to the wine labels and signature packaging.